Karl Ritter von Frisch (20 November 1886 – 12 June 1982) was an Austrian ethologist who received the Nobel Prize in Physiology or Medicine in 1973, jointly with Niko Tinbergen and Konrad Lorenz. His work was on the communication and senses of the European honey bee. He was the first to translate the meaning of the waggle dance. By doing the dance when they come back to the hive, honey bees indicated where they have found nectar, and other details. His theory was disputed by other scientists and greeted with skepticism at the time. Only recently was it definitively proved to be an accurate theoretical analysis. Polarization pattern: Light scattered in a blue sky forms a pattern of partially polarized ultraviolet light. This depends on the position of the sun, and is invisible to human eyes. Each lens unit of a compound eye has a UV receptor, and a UV filter oriented differently in each of these units, so a bee is able to detect this polarization pattern. A small piece of blue sky is enough for a bee to recognize the pattern changes occurring over the course of a day. This provides not only directional but also information on the time of day. 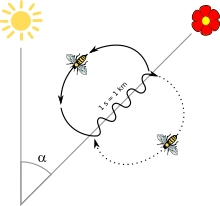 Variations in the daytime position of the sun: Karl von Frisch proved that variations in the position of the sun gave bees with a tool for navigation. They use this capability to get information on the progress of the day deep inside a dark beehive. This makes it possible for the bees to convey up-to-date directional information during their waggle dance, without having to make a comparison with the sun during long dance phases. A simple dance called “round dance” is used for nearby flowers. It means "there is a feeding place near the beehive at 50 to 100 meters". Blossom scent would also be picked up. The waggle dance proper is used to give the directions to a source further away. Other bees follow her as she dances, keeping in touch with their antennae. The dance takes a figure of eight, with variations such as angle and vigour of wiggles. The communication is apparently quite effective. ↑ J.R. Riley, U. Greggers, A.D. Smith, D.R. Reynolds, and R. Menzel 2005. The flight paths of honeybees recruited by the waggle dance. Nature, 435, 205–207. ↑ 2.0 2.1 Karl von Frisch 1953. The dancing bees. Harcourt, Brace & World, N.Y.
↑ Rohrseitz K. & J. Tautz 1999. Honey bee dance communication: waggle run direction coded in antennal contacts? J comp Physiol A 184, 463–470. This page was last changed on 2 October 2018, at 22:06.